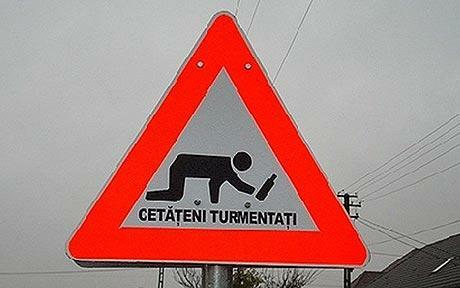 Just in time for St. Patrick’s Day: Drunken pedestrian warning signs. Alan of the Melbourne Urbanist sends along this link to the original Daily Telegraph dispatch; the sign is in Romania, but was apparently inspired by an unnamed town in Germany. Interesting idea, though one wonders if the sign distracts drivers from the actual presence of sloshed revelers in the road; it also presume sobriety and attention on the part of the drivers themselves. “We must warn drivers that sometimes people who have little control over their actions can suddenly appear in the road,” the town’s mayor said. It’s just as appropriate to change the word ‘drivers’ to ‘pedestrians,’ to my mind. Comments Off on Road Swill. Click here to leave a comment. 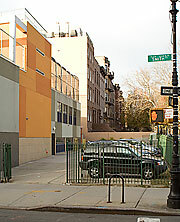 A plan to build on this parking lot, which neighbors said would destroy the character of Carroll Gardens, is off. I’m glad they backed off trying to do a full build-out — but now how about amending the zoning to ban the construction of parking lots on Carroll Garden’s historical courtyards? Comments Off on No Character. Click here to leave a comment. My latest Slate column examines this rare, but not as rare as you might think, phenomenon. Comments Off on When the Highway Becomes a Runway. Click here to leave a comment.